The MP4-12C is the first road car produced by McLaren since the company’s legendary F1 model of the 1990s. As such, all the elements supplied to the vehicle are unique to the vehicle. Pirelli & C. S.p.A. supplies the tires to the MP4-12C. The front wheels are 19 inches in diameter, making the sidewall height large enough to ensure good impact isolation and maintain the car’s aerodynamics. Because of the car’s so-called ProActive Chassis Control system designers were allowed to use a softer compound on the tires than found on most high-performance sports cars. This difference helps give the MP4-12C’s tires extra grip. Pirelli PZero Corsa sport tires are available as an option for use at higher temperatures and on circuits. One of the unique features of the MP4-12C is its sequential shift gearbox from Vocis, which is a subsidiary of Italian transmission specialist Oerlikon Graziano. The gearbox is part of the car’s dual-clutch transmission, which combines a smooth drive with the possibility to change gears quickly with no torque interruption or reduction in acceleration. Oerlikon Graziano uses a three-shaft architecture to help the parallel secondary shafts minimize gearbox length, allowing the engine to be mounted further back. All eight ratios use Oerlikon Graziano's high-performance synchronizers, which have been further optimized to allow substantially faster changes without compromising durability. The system is also designed to be lightweight, by being compact – the input shaft is very close to the output shaft so that the powertrain can be positioned low in the vehicle. The standard forged aluminum bell and cast iron brake configuration has been optimized for weight, saving about 8kg compared with the standard cast iron option that was considered. Robert Bosch GmbH supplies the car’s optional ceramic composite matrix brakes. In addition to the brakes, Bosch also supplies the fuel injection system, engine control unit and starter motor to the McLaren-sourced 3.8-liter V-8 twin-turbo engine. Visteon Corp. provides the supercar’s radiator, condenser and charge air cooler, while Takata-Petri Inc. supplies the vehicle’s steering wheel as well as a number of safety elements, including the airbags. 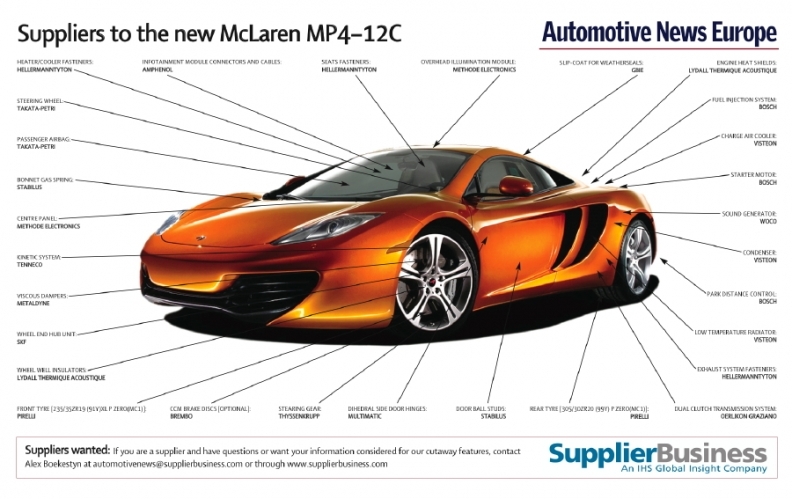 The MP4-12C will be produced at McLaren’s plant in Woking, England. IHS Automotive forecasts that 1,200 will be produced in 2011, with peak production of 1,900 in 2013. Prices start at 168,500 pounds ($271,000).